Los Angeles provides no limit of things to do, some awesome and some not so awesome. Since time is precious in this fast paced city, we decided to curate a list of things to do in Los Angeles every weekend that’ll help you decide how you want to spend your limited supply of attention (not to mention dollars!). This weekend includes a tequila & tacos music festival, Step and Repeat at MOCA, the Old Pasadena Film Fest, Outfest, a grunion run, humans vs. zombies, and an international soda tasting event. Cabrillo Marine Aquarium in San Pedro is having their final ‘Meet the Grunion’ event this Friday night. It includes an educational auditorium program and guided observation at the beach during the spawning. 8:00pm – 12:00pm. The cost is $5 for adult, non-members. Here’s more information, along with the complete calendar of summer grunion runs. Music? Art? Comedy? Food trucks? Step and Repeat, MOCA’s annual celebration of live performance is back for 2015 with a three-day event at the The Geffen. The weekend series has a special focus on highlighting local performance based communities around Los Angeles. This four hour tour of the sites and taste of what Hollywood has to offer will take you to The Roosevelt Hollywood to the iconic Capital Records and even Melrose avenue. You will make several stops at some of Los Angeles’ most talked-about restaurants for a variety of savory and sweet tastings. Half price tickets are available via Goldstar. Bon appetit! The Skirball will host Into the Night, an exciting evening of musical performances, extended exhibition hours, and a live liquid light show by the famed Joshua Light Show. This program features live performances by synth-pop act Tamaryn, psych rock band Mystic Braves and a DJ set by Aquarium Drunkard. 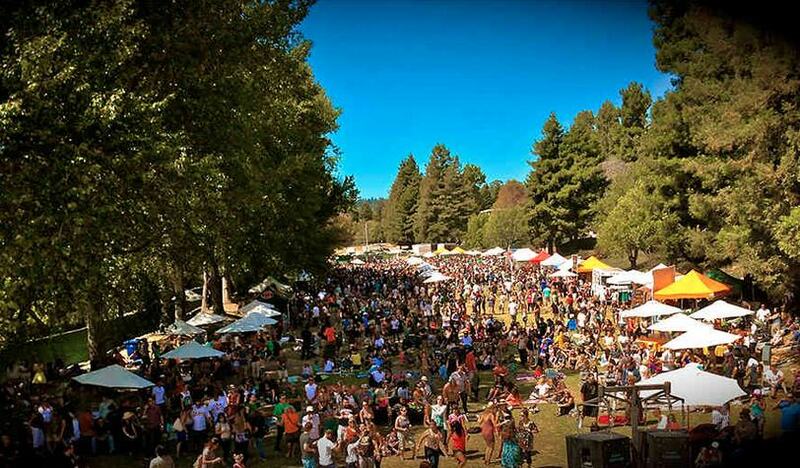 A weekend long event in Oak Canyon Park in Silverado, California the Woogie Weekend is put on by the folk who brought Woogie Stage to NorCals Lightning in a Bottle. The festivities include live painting, healthy food, morning yoga and house music by Jeremy Sole, Gigamesh,Mountain of Youth and more. The LF Warehouse Sale is back this Friday from 8:00am to 3:00pm. Save 60% to 80% on TONS of stuff. Denim are priced at $24, tees $6, blouses $18, dresses $28 to $32, shoes $25, leather jackets $45 and so much more. Cash and credit cards accepted. The MPK Night Market series is back as a two day weekend event full of food, crafts, live entertainment, shopping and a beer and wine garden. Happening at Barnes Park. 9. Josh Kun And Roy Choi Discuss To Live and Dine in L.A. The evening will feature the book To Live and Dine in L.A. by USC Professor Josh Kun with a Foreword by Chef Roy Choi. To Live and Dine in L.A. is a huge project of The Library Foundation of Los Angeles based on the Menu Collection of the Los Angeles Public Library. The event will take place at Booksoup and is free to the public. DineL.A. (aka L.A. Restaurant Week) started this week it’s a 14-day dining event where some of the best restaurants in Los Angeles offer special deals and menus for eaters to experience. More than 100 restaurants will be participation. Check the full lineup of participants via DiscoverLA.com and if you need some ideas on where to go, check out our picks. The Old Pasadena Film Festival brings back its annual summer series for an entire month of (mostly) outdoor movie screenings. Best part? All events are FREE and open to the public. American Apparel will be throwing an in-store shopping party. From 6:00pm to 9:00pm shoppers can save 30% off storewide, nosh on free bites and beverages, and enjoy live beats by a Viva Radio DJ. This week the party will take place at the Downtown Factory Store. The weekly summer dance party at the Music Center in DTLA. This week’s dance theme and class will be Bollywood! The shows and dance parties are 100% free to the public all summer long. Watch Roman Polanski’s noir cult classic Chinatown, starring a young Jack Nicholson and Faye Dunaway. The late-night screening is part of CineInsomnia taking place at Santa Monica’s Nuart Theatre. All summer long Barnsdall Art Park has a weekly fundraiser to benefit Barnsdall Art Park Foundation programs and projects. Perched on a hill with a gorgeous panoramic view of Hollywood, guests will enjoy fine wine and art in the gardens of Frank Lloyd Wright’s newly restored architectural gem, Hollyhock House. Silver Lake Wine will curate fine selections of boutique, small production, artisanal wines for park-goers as well as local gourmet cheese shop, Say Cheese. The Plaza Level at FIGat7th in DTLA invites the public for a free night of music with Superhumanoids and Tropics. Explore the bars and restaurants at Fig during the Taste happy hour starting at 4:00pm! Doors open at 7:00pm for the Plaza Bar and the show starts at 8:00pm. Westfield Culver City and Westfield Fashion Square in Sherman Oaks are bringing back Summertime Cinema, a summertime family fun movie screening series. Every Friday, starting July 10th through August 7th, beloved movies will be screened outdoors at both centers allowing attendees to relive the magic of the big screen. The movies are free to the public and viewers will enjoy various special goodies at the event. Starting in June Grand Performances begins a summer-long concert series that brings Angelenos together with an eclectic mix of musical performances at a unique setting in Downtown L.A. The shows are 100% free to the public all summer long so bring you dance moves! LACMA’s award winning Department of Music Program is a remarkable city resource, providing hundreds of free concerts and musical events every year for Angelenos to enjoy. This Friday their summer-long jazz series continues at the BP Grand Entrance. The third annual Taco & Tequila Music Festival is a two-day event (Saturday and Sunday) in Oxnard featuring delicious taco vendors, craft beers, tequila sampling , margarita booths and live musical performances. If you’re going on Sunday, be sure to take advantage of this $30 voucher from our affiliate Goldstar that gets discounted admission for two, two souvenir glasses and two free margaritas. Get vouchers while supplies last! If you want a fun way to explore the history of Hollywood, why not try this urban scavenger hunt? Team up with your friends to crack codes, solve puzzles, and discover facts in a fast paced and fun-filled competition. Get more information and discounted tickets via Goldstar. The DogVacay Fit Fest will take over the La Brea Tar Pits in Hancock Park and your dog is going to love it! Doggy yoga, snacks, a doggy pool are just a few of the super adorable things your pup gets to enjoy at the event. Best of all the event is free all you need to do is RSVP. The Santa Monica Pier’s hit summer wellness program, Hey There Muscles, is back for a second year of free weekend workouts. Led by the original Hulk himself, Lou Ferrigno, his daughter Shanna and their rotating team of fitness gurus, the program kicks off on Saturday, July 18, and will continue for four Saturdays at 9:00a.m. on the West end of the Pier. Classes offer a total body workout with motivational pep talks from some of LA’s best fitness and nutrition instructors. Join the Three Amigos as they take on a gang of outlaws harassing a Mexican Village the movie stars comic legends Steve Martin, Chevy Chase and Martin Short. This Eat|See|Hear screening will take place at The Autry in Griffith Park. We suggest you bring low chairs, the large grassy lawn is also perfect for cozy blankets and pillows too. There will be plenty of food trucks to nosh on while you watch the movie! Taking place at the Rooftop of the Plaza at Continental Park in Los Angeles, White Light White Night is a event aimed to raise awareness for Walk With Sally a charity dedicated to providing free mentoring support programs and services to children of parents, guardians or siblings who have cancer or have succumbed to cancer. The evening benefiting the charity will include tastings from 20+ restaurants, specialty cocktails, beer, wine and a live performance by Super Diamond a Neil Diamond tribute band. Come out and support a great cause! Flynn Skye’s sample sale will discount items from 50% to 90% and it’s all happening in Venice on Abbot Kinney, Saturday 10:00am to 4:00pm and Sunday 10:00am to 3:00pm. 27. To Live and Dine in L.A. The latest exhibition to hit the Los Angeles Central Library: To Live and Dine in L.A. is one for the foodie nostalgic. Come celebrate the history of food in Los Angeles and view a massive collection of rare, first-edition menus from restaurants that have long since closed. The exhibit aims to promote the historical significance of LA’s food culture, and will feature over 50 food and menu related programs, including lectures, cooking demos and nutrition workshops. Check out more information, times and dates on their offical page. New York–based artist Joseph Holtzman covered the walls of the Hammer’s project gallery with green felt, painted the ceiling green and placed Christmas-colored couches in the middle of the room. Its really the kind of couches you would sink into the moment you sit on it… hey guess what! you’re allowed to sit on these! A selection of Holtzman’s recent works from 2006 – 2011 will also be on view in the space designed by the artist. This week join Cinespia in a screening of Grindhouse. Robert Rodriguez and Quentin Tarantino’s homage to the grindhouse era is a complete experience with a double feature, fake trailers, missing reels and scratches. DJ Gaslamp Killer will spin tunes before and after the screening. If you’ve always wanted to check out the amazing beauty of Joshua Tree but needed a little extra motivation, consider this package that includes bus fare, a guided tour of local sights, and opportunities to dine at some of the best eateries in the area. Awesome excuse to go on adventure if you want to liven up your weekend. Get more information and discounted tickets on the package at Goldstar. Galco’s Old World Grocery is presenting its fifth annual summer tasting event Around The World in 80 Sips, focusing on international soda pop. Located in Eagle Rock Galco’s invites soda-lovers of all ages to sample a wide selection of carbonated confections crafted in Italy, France, England and more. Like farm-fresh produce? Like supporting healthy eating awareness for the entire community? This event is totally for you! LA Grow provides a community farm-to-table experience in an event that truly represents healthy eating in action. Join RootDown LA, a South Central based non-profit at The Wiltern for some beers, bites, music, and the freshest fare around. Come to the 18th Street Arts Center for free guided studio tours and champagne this Sunday! The Champagne Socials happen twice a year, meet and greets with members, access to new works in progress and intimate discussions with artists and of course tasty libation to be enjoyed during this social event. The Springs in Downtown Los Angeles will be holding their second monthly Vegan Wine & Cheese Tasting. This month, The Springs’ sommeliers have chosen a 6 wine flight of summertime-inspired Rieslings and Rosés paired with house-made vegan cheeses. Tickets can be purchased for $20 at TheSpringsLA.com or by emailing tickets@thespringsla.com. Want to nerd out in the most apocalyptic way possible this weekend? Take a drive up to Camarillo on Sunday and see if you can survive a massive onslaught of the (pretend) undead using nothing but your wits and a nerf blaster. The July showing of Silents Under the Stars will screen 1920’s Gloria Swanson flick Why Change Your Wife? at Paramount Ranch. Tickets are available online and event perks include live music, an authentic presentation with 16mm projectors and surprise silent shorts before the film. Pack blankets, dinner and a flashlight as the path to the ranch is not lit. Want to get our to-do lists straight to your inbox every week? Sign up for our weekly newsletter.